Welcome to The Town of Fenwick Island! Come enjoy your vacation with us in Fenwick Island, the most southeastern of our Delaware beaches. Fishing, crabbing, kayaking and windsurfing may be enjoyed on the bay. Swim in our beautiful ocean or relax by sunbathing on our guarded beaches. Fenwick Island is a year-round community that welcomes visitors. We hope you will join us for fun in the sun! We hope you are never sick or injured while visiting Fenwick Island. However, if you need urgent care. call or visit one of the urgent care locations below. In the event of an emergency, call 9-1-1. 75th Street Medical Center 7408 Coastal Hwy Ocean City, MD 21842 410-524-0075 *Open 16 hrs/day 8 am-12 am Memorial Day – Sept 20th. Otherwise, Open 9 am-6 pm Mon – Sat in the off season. Trash is collected on Monday and Thursday from May through September. Curbside Recycling is picked up every Friday from May through September. The Town of Fenwick Island does not make recommendations for lodging. Learn about our beach and park safety rules and regulations. Don’t miss a visit to the Fenwick Island Lighthouse. August 1, 2009 marked the 150th Anniversary of the official lighting the Fenwick Island Lighthouse. Visit the New Friends of the Fenwick Lighthouse for more information (opens to an external link). We hope you enjoy your vacation with us. We ask that you follow these general safety rules while you are here. General Noise: Reasonable noise and noise activities in the residential community created by productive activities such as house maintenance, gardening and grass cutting are permitted between the hours of 8:00 AM and 8:00 PM. Disorderly and disruptive noise-makers are subject to a fine. Construction Noise: NO construction is allowed on Sundays, Holidays or before 8:00 AM or after 6:00 PM daily. NO pile driving June 1 through August 31. 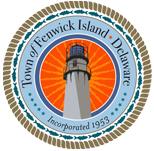 Parking permits are required for all streets within the corporate limits of The Town of Fenwick Island from May 15 though September 15. Learn all the rules and regulations on bringing your pets to Fenwick Island Beach. Learn about rules and regulations for campers, motor homes and much more.